This analysis seeks to update the global sovereign risk of bankruptcy following the developments of the past 9 months that have seen governments and economic policies change, economic austerity plans implemented or failure to implement, as well as the bailout of two Eurozone member countries with first Greece in May and now Ireland's Euro 85 billion bailout. My original analysis of March (30 Mar 2010 - Global Sovereign Debt Crisis, Country Bankruptcy Relative Risk of Default ) concluded in the high debt default risks presented by Ireland and Greece, with Belgium, Portugal, UK and Spain not far behind as illustrated by the below graph. The country risk of bankruptcy / bailout represents the current risk of a country going bankrupt and therefore triggering a pre-default bailout (if affordable). This takes into account each countries current GDP growth rate, total public debt, public and banking sector liabilities, budget deficit, total external debt and sovereign bond market interest rates, other determinants include the ability to devalue and part inflate ones way out of debt which is not possible for most eurozone members. The bailout mechanisms that the euro-zone has implemented to date only act to delay ultimate bankruptcy where in Greece and Irelands case involves financing the next 3 years or so of deficits and debt rescheduling which has the effect of adding to a bailed out countries total debt burden and therefore increases the debt pressures on the economy as debt interest as a percentage of GDP rises each year until the country is forced to restructure its debts. The risk of debt default contagion measures the global impact of each country going bankrupt as a percentage of between 0% and 100%, where the US equals a 100% risk in terms of what the fallout would be on the global financial system if the United States went bankrupt, which at 100% implies that the whole worlds financial system and probably economy would collapse. For instance Iceland going bust during October 2008 had little contagion effect because of its relatively small economic size and external debt foot print, whereas countries such as Ireland have a far greater contagion effect, hence the E.U. / IMF bailout of Ireland which at Euro 85 billion is far less than the impact of contagion spreading and increasing the risks of default in other larger countries as counter parties to Irish banks and holders of Irish debts would come under pressure. However, a bailout does not wholly negate the contagion risk factor as bond holders and counter parties would still be subject to the likelihood of a debt restructuring at some point in the future which therefore would still to some extent elevate the risks of default for all other exposed countries. The key data used to determine the contagion effect is the size of the economy and total debt and liabilities including external. All countries are trending towards debt default / restructuring. However most countries are defaulting on their debt by means of high real inflation, therefore outright debt default risk is lower for most countries as they are able to avoid a debt default / IMF bailout by eroding the value of public debt by stealing the wealth of savers and purchasing power of workers earnings through inflation. For instance the UK government prints money that it loans to the bankrupt banks at 0.5% to buy UK government bonds at 3.3%, hence why the yields are lower than the likes of Spain and Italy, which acts as a safety valve preventing outright default, but the price paid is in high inflation, with the doctored official inflation measure of CPI is at 3.2%, the more recognised RPI at 4.5% and real inflation at 6% as the following graph illustrates. The CPI inflation trend is inline with forecast expectations as of December 2009 (27th December 2009 (UK CPI Inflation Forecast 2010, Imminent and Sustained Spike Above 3%). The inflation stealth debt default is reflected in this analysis as a lower risk of outright debt default / bailout, as the higher the real inflation rate is (upto a limit) then the lower will be the relative risk of outright default as governments use inflation to steal the value of earnings and savings to reduce the value of debt. Also considering that all currencies are in perpetual free fall against one another to achieve the same default through inflation outcome then usually the debt denominated in foreign currencies should pose less of a problem than that denominated in the domestic currency than many commentators perceive it to be. 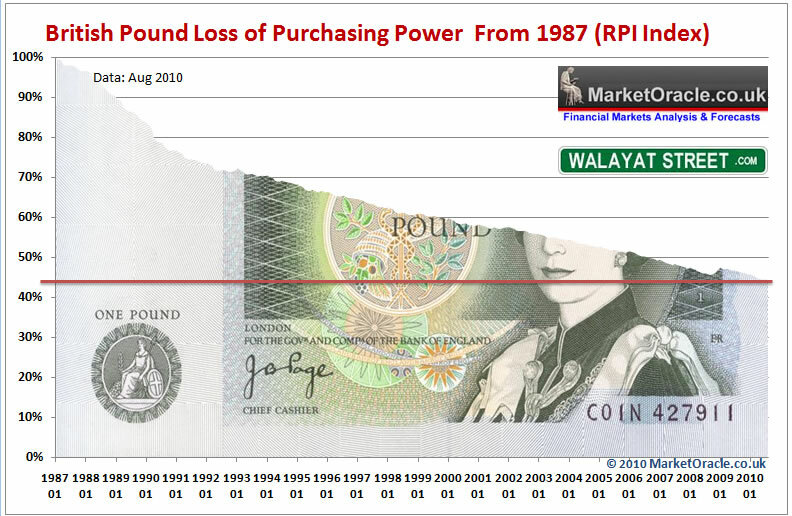 For instance Britain's stealth inflation debt default is reflected by the British Pound in exchange rate terms being roughly where it was against the U.S. Dollar 20 years ago, however the following graph shows that sterling has lost over 40% of its purchasing power on the RPI inflation measure over the past 20 years. Also having more of ones debt in the domestic currency does reduce the risk of default, which is why the United States risk of default remains very low. At the other end of the currency devaluing high real inflation debt spectrum are the Euro-zone PIGIBS that are locked in the Euro and thus cannot default by high real inflation and even if they left the Euro would not address the fact that their debt is denominated in Euro's unless all of their debt at the same time was also converted into the new currency resulting in an instant huge devaluation (probably an hyper inflation panic event). Therefore whilst the PIGIBS remain in the Euro-zone then they can only devalue internally by cutting wages and spending so as to make their economies more competitive against other Eurozone members. Though the flaw here as opposed to using inflation to default on debt denominated in local currencies is that as the economy contracts the debt increases as a % of GDP and hence over time the risk of default increases which is why the Euro-zone members will probability require continuous bailouts until they default on their debts which is inevitable. The updated analysis is presented as a graph with the two axis as the Sovereign Risk of Bankruptcy / Bailout and the Contagion Factor. Ireland - Has now been bailed out at a cost of Euro 85 billion. In terms of debt contagion Ireland at 15% posed a far greater risk than Greece, which means that if Ireland had outright defaulted on its public and banking sector debts then it probably would have crashed the global economy, hence the bailout. Belgium - At 29%, continues to pose a high default risk and stands next after Portugal for a bailout, especially as the contagion risk at 10% is more than double Portugal's . Estimated bailout cost rises to Euro 175 billion. Spain - At 26% risk of default carries a 16% Contagion factor. Spain is a much larger economy, hence the estimated bailout costs now start to jump substantially by rising to Euro 550 billion. Italy - At a current default risk of 17%, suggests that Italy could survive for several more years, however if Portugal, Belgium and Spain are bailed out then Italy would come under far more pressure. The contagion factor for Italy is similar to that of Spain of 16%. A bailout would cost an estimated Euro 800 billion. UK - Has an improved risk of default of 14% since the March update as a consequence of coalition government measures and due the UK's ability to stealth default by means of high real inflation. However should all of the above have defaulted / been bailed out then the pressure on UK would become very high which would manifest itself in a severe plunge in sterling. The UK has a contagion factor of 61%, second only to that of the United states which means that should the UK default then it definitely would bring down the worlds financial system and global economy with it. A bailout to prevent bankruptcy would cost an estimated Euro 850 billion. France - At 12% risk of default, has a high contagion factor of 34%, which means that if France should ever default then it would probably take the global financial system down with it. A bailout would cost an estimated Euro 1 trillion. Bailouts - Again bailouts just delay the inevitable debt restructuring. Contagion factor - The most important factor is the contagion factor, where countries approaching default, even if they are subsequently bailed out could still crash the global financial system if their contagion factor is high such as that for the UK, France and Germany. Luckily there is no sign that any of these three is likely to reach a critical state that risks debt default / bailout during the next 6 to 12 months, so have time on their sides to address budget deficit and bank debt issues. Also despite widespread speculation surrounding US debt and liabilities, the United States remains at a low overall risk of default at 5%, though up on March's 3%. Another important factor to note is that countries such as Pakistan, Mexico and India are at a far lower risk of default because their external liabilities are smaller and debt metrics less critical compared to that of Euro-zone members, which is why the likes of Greece, Ireland and Portugal have required bail outs whilst the former have not, as the original analysis of March 2010 implied that the debt risk world has been turned upside down where those that were deemed to be high risk countries a couple of years ago are now low risk and those that were low risk are now high risk countries. Whilst Portugal is next with Belgium and Spain to also trigger a probable bailout of sorts during the next 12 months. However it is possible that a line could be drawn under the bankrupting PIGIBS with Spain, especially if new mechanisms are introduced by the Eurozone for a more orderly partial debt restructuring that is able to release pressures on the likes of Italy and France and therefore have far less of a contagion effect. In the meantime all savers and depositors should seek to protect their wealth and savings against the risk of PIGIBS contagion by ensuring that they limit their exposure to PIGIBS banks and that their savings are within the compensation limits as discussed at length in the recent article (26 Nov 2010 - Euro Debt Crisis Bankruptcy Bailout Queue, Protect Savings & Deposits From Banks Going Bankrupt! ). As mentioned in the recent analysis (14 Nov 2010 - Bankrupting Ireland in Economic Depression Announces Policy of Quantitative Cheesing), the Eurozone needs to develop orderly mechanisms for partial debt restructuring to take place so as to prevent outright default, triggering a costly full bailout. The current system of the ECB funding the bankrupt European banks at 1% is not working, as it is the primary reason for the current sovereign debt crisis as after the 2008 credit crisis the European banks took ECB cash and bought high yielding PIGIBS debt with it, hence the current crisis. One mechanism to address this is if future PIGIBS bond issuance was sold on the basis that a certain percentage of the debt could be defaulted on if the issuing government at the time of maturity had a high budget deficit. This would result in higher interest rates for PIGIBS debt to reflect the risks of partial default as well as produce an orderly market for slow serial debt default rather than crisis events that hits the sovereigns whole bond market i.e. it could be on the basis that an issue of 10 year Portuguese debt at a 8% interest rate would lose 3% of its capital on maturity for every 1% that Portugal's budget deficit was above the 3% deficit target, or utilise some other similar measure. However the above mechanism would only apply to future debt and it would take many years for new default prone debt to replace existing debt, therefore there needs a mechanism to restructure existing PIGIBS debt, especially for Greece, Ireland and Portugal as their debt remains unsustainable. The difficulty here is in partially defaulting on Greece Ireland and Portuguese debt without triggering a Euro-zone wide bond market panic, where the only country that could attract bond market investors would be Germany. Clearly the mechanism for restructuring PIGIBS debt would be for the ECB to restructure the Eurozone banks so as to separate public debt from bank debt. Much as Ireland is being forced to do with regards its banks, which should instead fall under the responsibility of the ECB which would reduce the burden on PIGIBS from banking sector liabilities. During the past week there have been some signs that the Eurozone does intend on enacting some sort of ultimate haircut for bond market investors so as to reflect the risks. However there is no sign that any member country wants to leave the Euro-zone, which for especially Greece and Portugal would probably be in their long-term best interests as their economies will never be able to compete against the likes of Germany on a level playing field and therefore look set for a decade of low growth compared with the industrialised Euro-zone. Similarly neither will Germany leave the Euro-zone as it relies on the Bankrupt PIGIBS to keep the Euro weak whilst also exporting to a captured internal market. At the end of the day, bond markets need a reason to buy sovereign debt, if there is a great deal of uncertainty as to what they will get back on maturity then they won't buy it. Therefore the Eurozone needs to introduce certainty for the bond markets for especially the PIGIBS debt market to function, otherwise the only buyer of the their debt will be the ECB. The Dollar has apparently benefited hugely as a consequence of the Eurozone debt crisis of the past few weeks by rising from a low of 76 in early November to a high of nearly 81 last Friday, which is being taken by many to infer that the dollar has entered new bullish phase that possibly targets a bull run to as high as USD 90. However the trend whilst coming as a surprise to the dollar collapse merchants and triggering the emergence of a new bullish consensus, is inline with the last in depth analysis and trend forecast into Mid 2011 (12 Oct 2010 - USD Index Trend Forecast Into Mid 2011, U.S. Dollar Collapse (Again)?) that forecast a bullish trend for the USD from 76 to target USD 80 by early December. The forecast path for the dollar should now be for the primary downtrend to resume towards a Mid 2011 target of between 69-70. Similarly Sterling should resume its uptrend against the US Dollar which targets a trend to £/$1.85 by mid 2011 (04 Oct 2010 - British Pound Sterling GBP Currency Trend Forecast into Mid 2011). Therefore the current price of £/$ 1.5580 should should represent the approx low point for the whole move from 163. Ensure you are subscribed to my always FREE NEWSLETTER to receive in depth analysis and forecasts in your email in box. 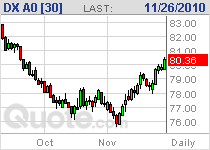 The USD index is now over 81, should you not revise your forecast as it does not look like it is going to fall? Also the Dow jones has broken lower below 11,000, do you still expect 12,000 by year end ? Stocks - I will do a quick update later this week. The Dow at 11k is little different from the forecast of where the Dow should be at this point in time (marginally lower than forecast trend). I STILL expect the Dow to resolve towards above 12k by mid Jan 2011. Unlike many analysts that frail in all directions, I don't tend to change my forecasts unless they are negated, and to date the Dow has done nothing to negate my original forecats of 6 weeks ago. Again, in both cases PATIENCE is in order, something that perhaps investors and traders need to learn rather then get sucked into minor non events such as USD being marginally above 81 rather than marginally below 81, same for the Dow dipping to 10,925 before rallying is just intra-day noise. Liam,Always give a forecast a time window of 5-7 days before asking again if forecast is still correct.